This is a great product for its price. If you’re interested in a reliable all-in-one PC that can perform daily tasks, then the HP All-in-One 22-b235qe is for you. It’s a budget friendly machine that has been designed to give the average user everything they need, from the ability to do homework to enjoying social media and web browsing. There is enough processing power to do a bit of multi-tasking. You’ll also appreciate how compact it is. The dimensions are 21.23 in width, 7.28 in depth, and 15.70 in height (inches). All of the hardware components (RAM, hard drive, CPU, etc…) are neatly packed into the 21.5-inch display. This display is FHD IPS edge-to-edge with multi-touch capabilities and a resolution of 1920 x 1080 (WLED backlit). It’s a nice display that shows off colors vibrantly. The 22 inch AiO has a nice design compared to other AiOs out on the market. Instead of the same boring gray or silver, it’s sleek and black. It appears to almost float on the pedestal stand, and you can pivot the screen for a better viewing angle. There are four USB (two 2.0 and two 3.0) ports located in convenient spots for easy access. A microphone / headphone combo port is also included. The HP All-in-One 22-b235qe has WLAN wireless technology for home Wi-Fi networking (802.11 a-b-g-n-ac), as well as Bluetooth 4.2 M.2 technology (combo). Is an all-in-one computer for you? It is if you don’t already have a computer monitor on hand to use with a new traditional desktop PC, which does not come with monitors anymore. An AiO is also a good choice if you want a display larger than one that comes with a laptop. The HP All-in-One 22-b235qe is still compact enough that it can fit on any table or desk. You could even mount it on the wall with the right tools and equipment. If you do already have another monitor, you can still use it by connecting it via HDMI. Also included with this machine is an HP webcam, dual array digital microphone, integrated speakers, and DTS Sound+ technology. The pointing device is a wired optical mouse (USB) and keyboard featuring volume control. Overall, this is as great PC to invest in. 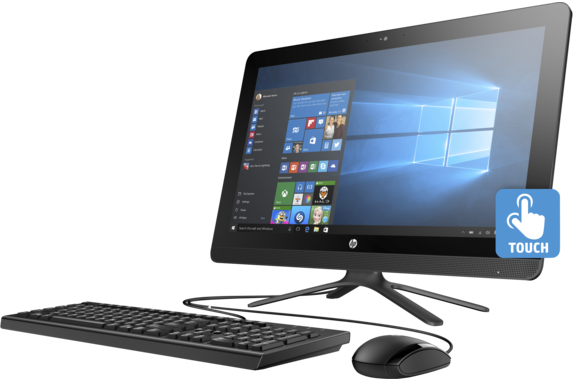 The HP All-in-One 22-b235qe is easy to set up, use, and has a lot to offer for just about any type of user. HP deals are among the best in the computer industry. You’ll find everything from computer discounts to special offers on accessories. All you need to do is use HP All-in-One 22-b235qe promo codes to help you get the best deal possible.